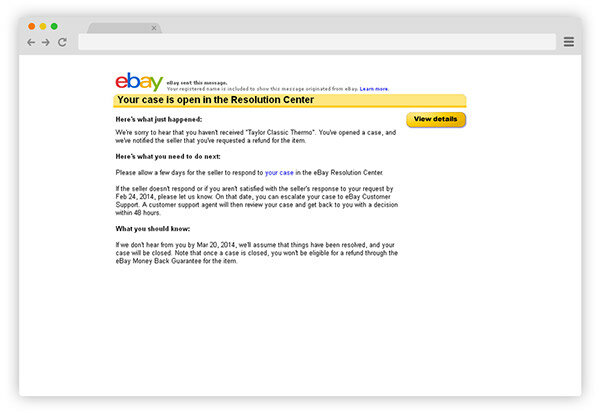 When eBay users encounter a problem with a transaction that they can't resolve on their own, they can open a case in the Resolution Center for eBay to mediate the issue. The Resolution Center is the essential final step in resolving buyer-seller disputes on eBay, and ends in a conclusive decision by eBay in favor of one party. However, the Resolution Center can only be accessed via eBay's desktop website, so I designed a Resolution Center flow for eBay's mobile app to add convenience and reduce friction in the mobile experience. 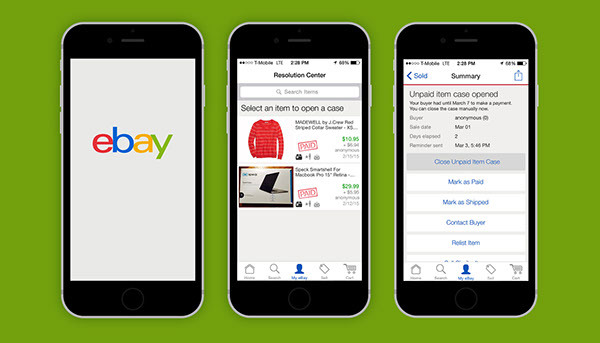 Even though the Resolution Center is an essential part of eBay's dispute resolution process, it is not included in the mobile app. In addition, the desktop user experience could be improved by allowing users to open a case from a sold item details page as well as from the Resolution Center. When users do open their case from the Resolution Center, it would be more convenient to ask them to choose from a list of transactions instead of asking for the item number, which they would have to reference elsewhere. 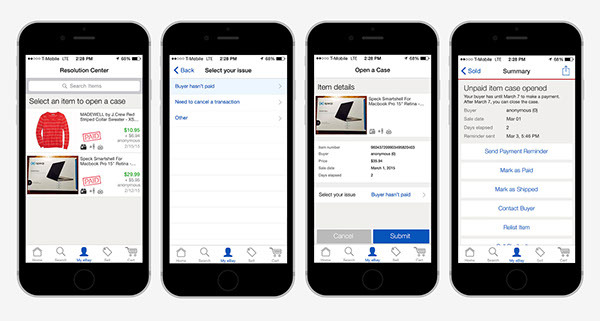 I created two new Resolution flows for eBay's mobile app, one that allows users to open a case through the Item Details screen, and another that originates from the Resolution Center. 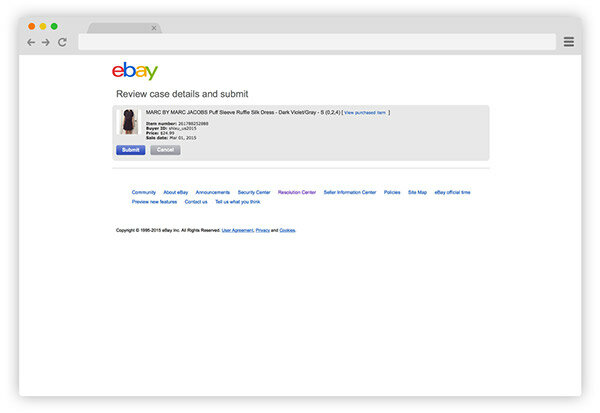 When users view a purchased item that hasn't been paid for or delivered, they have the option of opening a case with eBay directly from Item Details. In cases where the type of case is more ambiguous, an intermediate screen would ask users to select their issue from a list before opening the case. In the existing app, there is no mention of opening a case in the Resolution Center at all, and when users open a case through the desktop website, it doesn't show up on the app. This is a problem because new users might not even realize they can open a case, and it's confusing that the app does not reflect actions taken on the website. 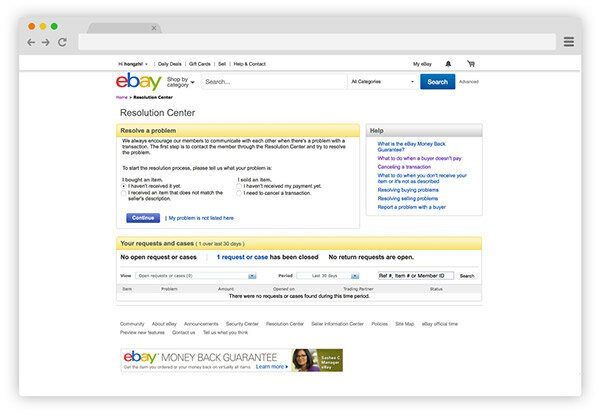 Making the Resolution Center more prominent and transparent encourages eBay users to report unethical practices and maintains a safer marketplace. The re-designed Resolution Center asks users to select the item they have an issue with first to narrow down the number of possible issues in the next step. Once the case is opened, the details of the case are shown under Item Details, with instructions on how to move forward with the case. 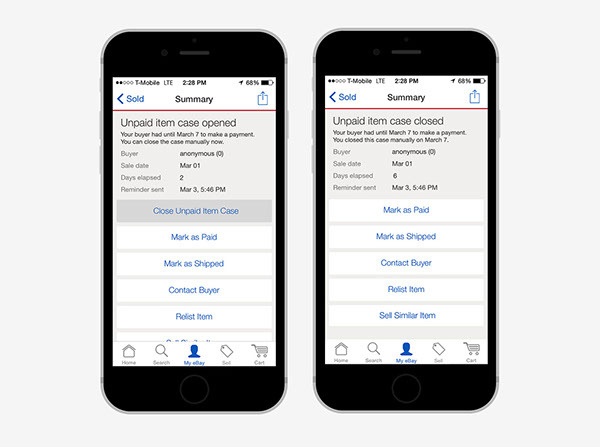 This helps users understand the process and time requirements for closing a case. After the number of allotted days has passed, users can manually close the case through the resolution flow. 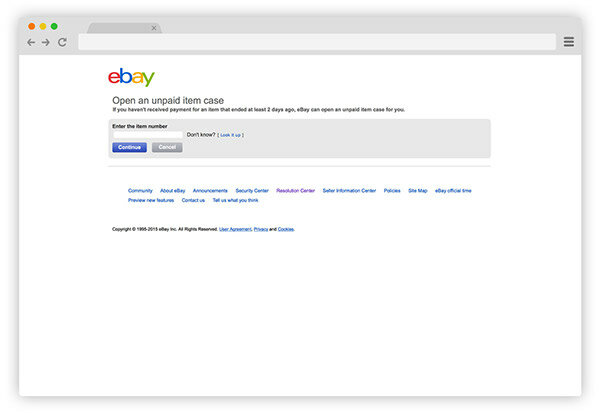 In certain situations, cases must be closed manually for the claimant to receive compensation from eBay or the other party. 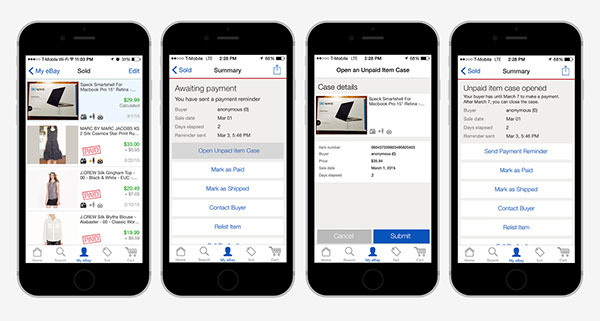 I designed eBay's dispute resolution experience for mobile.